This is a sponsored post by DataRank and KC Masterpiece. All opinions are my own. Ever since my second child was born earlier this year, it has been hard to find the time to cook a meal. I have been using several quick recipes to get supper ready at a decent hour. 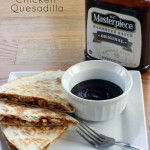 We have enjoyed the BBQ twist to a chicken quesadilla recipe. The best part is…you only need 4 ingredients! Yes, I did say 4. The best part about this recipe is that we always have chicken, cheese, and KC Masterpiece in the house. We use KC Masterpiece for BBQs, baking chicken, and more. It goes well with all types of meats. The Original KC Masterpiece is what gives these quesadilla’s their bold flavor. 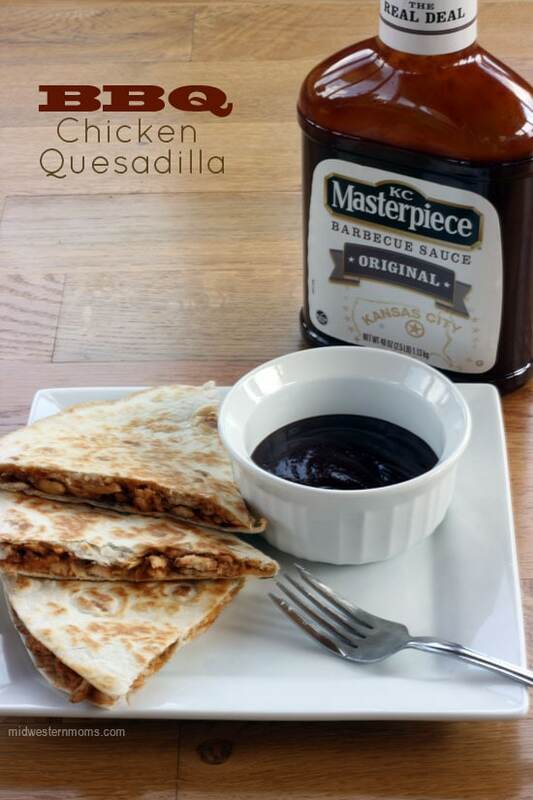 I know it may seem a bit odd to have cheddar cheese in with BBQ chicken, but it has a good flavor and it helps keep the quesadilla together once it is cooked. Quick and easy bbq chicken quesadilla recipe. In a medium bowl, mix the shredded chicken and the BBQ sauce. Heat your skillet (greased) on medium heat. Lay 1 tortilla flat and add a layer of cheddar cheese, then a layer of BBQ chicken, and another layer of cheddar cheese to 1/2 of the tortilla. Fold the tortilla in half and place it in the skillet. Cook on 1 side for a few minutes or until lightly brown. Flip the tortilla to cook the same way on the other side. Repeat steps for remaining tortillas until you run out of BBQ chicken. You may want to add the BBQ sauce 1/4 cup at a time. That way you can get the best flavor for you. What is your favorite quick and easy recipe or BBQ recipe? Looks yummy! I wonder if I can make this with rice tortilla? Oh the ideas you have just given me!! I tried your recipe and it was so quick and the best part very delicious!!!! I am glad you liked the recipe!